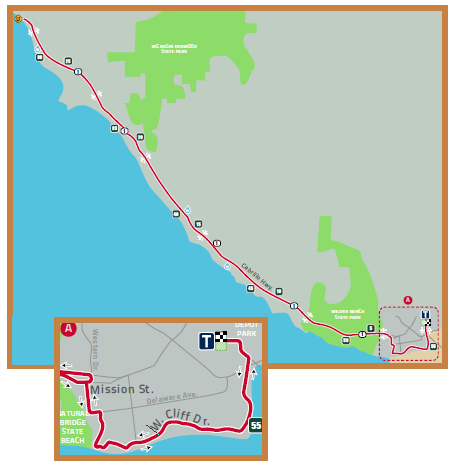 The 4th Annual IRONMAN 70.3 Santa Cruz will take place on Sunday, September 9, in and around the Santa Cruz and HWY 1 areas. IRONMAN 70.3 Santa Cruz consists of a 1.2-mile swim, a 56-mile bike ride and a 13.1-mile run. Traffic on Hwy 1 from Western Dr. to Pigeon Point Rd. will be closed to weekend traffic northbound starting at Western Dr. from 7 AM to 9:30 AM and southbound beginning at Pigeon Point Rd. from 8:15 AM to 11:45 AM. During this time the highway will be open to local traffic within the bike course. The following roads will experience delays along HWY 1 on race day Sunday, September 9th. Local traffic will be allowed to enter HWY 1 from the side streets when safe to do so. CHP or flaggers will control traffic along the course and allow traffic to cross between riders when safe. Gazos Creek Rd. Bonny Doon Rd. White House Canyon Rd. Coast Rd. Davenport Landing Rd. Shaffer Rd. Cruz511 is a service of the Santa Cruz County Regional Transportation Commission and is partially funded by Measure D.